The big bank saw profits slip to $798 million from $835 million for the second full quarter since its move to shutter FirstLine and focuse on selling more mortgages through its branch network. “I wouldn’t read too much into our not raising the dividend this quarter,” CIBC president and chief executive Gerry McCaughey said during a conference call this week, pointing to a slight rise in total revenue, coming in at $3.18 billion. 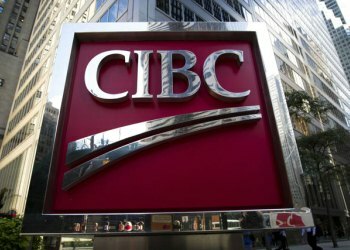 CIBC’s decision to close FirstLine last year effectively removed 90 per cent of their mortgage broker sales. That is being compounded by the kind of continuing profit margin compression from low interest rates most banks are now grappling with. Still the first quarter saw profits rise at those institutions. TD recorded a Q1 2013 profit of $1.79 billion, up from $1.48 billion in Q1 2012 with revenues of $5.97 billion; and RBC increased profits for Q1 2013 to $2.07 billion from $1.86 billion, with Q1 2013 revenues reaching $7.91 billion. Amid low interest rates and high consumer demand for loans, banks are expected to be under pressure in 2013 to grow their retail bank earnings as fast as they have in previous years. The earnings were a strong signal that RBC was, at least for now, holding off the expected slowdown in domestic retail banking. The bank's margins in personal and commercial banking declined by 1 basis point, which was a smaller drop than investors were fearing as low interest rates and competition for loans eat away at profit margins. TD shared the same pain as the other major banks, pointing to “continued market compression from record-low interest rates,” MortgageBrokerNews.ca learned from yesterday’s conference call. TD officials hoped that through security sales over the next year, they would help ease the NIM, as low interest rates are expected to remain in place for some time. BMO was the first out of the gate with its first quarter financials earlier in the week, showing an increase in residential mortgages from $81.3 billion in Q1 2012 to $89 billion Q1 2013, an unexpected jump of 9.5 per cent ($7.7 billion). TD showed an increase in mortgage assets during the same period of $174 billion from $158 billion; and RBC reaching $175 billion for Q1 2013 from $167 billion in Q1 2012. National Bank is to release its results today, with Scotia following on Tuesday, March 5.